Hi Folks! My last two posts were about the 10-year-old boy not allowed to bring his pen knife on a nature trip as well as the ridiculous rules for adopting a pet that now sometimes include things like, “Pet needs one parent home at all times,” and, “Cat cannot be kept as a mouser in a barn.” One guy wrote yesterday that his home, replete with kids, was rejected by a shelter because it was “too exciting” for a dog. TOO EXCITING? So it no longer matters how constricted the life of a boy or dog is, so long as it is absolutely SAFE? That is the ULTIMATE goal, for all beloved species? Over and over we are being told that the kinds of things animals and children have done since the dawn of time are suddenly too taxing, difficult and dangerous for this generation. Instead, adults must take care of all their child/pet’s needs and then some. Adults (once background checked and found absolutely perfect) must keep the kid and/or pet from the fulfillment…excuse me, the DANGER of doing ANYTHING on its own. No mousing for you — I bought you fancy cat food! No whittling for you — I’ll use MY pen knife to cut whatever you need! That’s not parenting. That’s bonsai. STUNT THE ONES YOU LOVE! Our marching orders are to stunt our kids and pets. We’re told to thwart their natural curiosity and desire to be part of the world. THAT is why I posted both those stories and THAT is why I run Free-Range Kids: To remind us that society is brainwashing us to believe that the world is unsafe immediately outside the door, that any parents not devoting their entire lives to constant child supervision is going to regret it, and that asking anything of anyone other than ourselves is asking for trouble. Only we, the parents, are smart and competent enough to take care of (and take over) our kids’ lives. Don’t grow up! Stay cute and helpless! 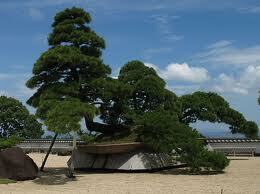 Bonsai trees are beautiful, if done well. Bonsai children, on the other hand, are anything but adorable; whining, fretful, aimless, and physically, morally, and intellectually weak. Bonsai is a good and beautiful thing. I always envisioned “helicopter” parenting like a news or police helicopter… they don’t just hover, they interact, guide in bad ways (like a criminal trying to avoid the helicopter running into a bog or into traffic), critique, etc. Bonsai children are not as cute when they hit college. I know… I teach some of them. Optimistic closing: I also teach some bright, young minds with a good work ethic and strong initiative… They keep me excited and young. Just like a bonsai tree, we are to clip, prune, and design our children. All this to keep them the perfect specimin, and just how they are. There’s a new one for you “Designer Kids”, groomed, prepped and styled. I think the worst of this is the “I’m a better parent than you because…” type of bragging that goes along with it. Our daughters take a martial arts class a couple of times a week. Not for “self-defense” or for competitions, but for FUN (I know, shocking). There is a dad there who is CONSTANTLY criticizing his daughter’s technique — even when the INSTRUCTOR says she’s perfect. In the few breaths between his criticism, he brags about how many trophies his daughter has won in competitions. I would never survive in the States. It seems like all of my American friends brag about how their kids are all straight A students who are actually 3 grades ahead in math and reading. Their kids are also involved in daily adult-directed after school activities. Of course they must be driven everywhere because it is “too dangerous” to walk or ride a bike. Their kids never have time for free play or to be kids. I would be sent to the Bad Parents’ Prison in the States. My son only has one extracurricular activity (Boy Scouts). He does have to be driven to the Scout meetings because they are 20 km (about 12 miles) from my house. But he rides his bike to school when it isn’t raining or snowing; and he also cycles or rides the bus without adult supervision to play with his friends on the ball fields on the base where I work. He and his friends make up the rules for the games that they will play depending on the number of kids present. Judging from the dirt on his clothes, my son has a lot of fun playing with his friends. I think that when my son turns 18 and goes off to university, he will be more prepared for life than a child whose parents did everything for him because of perceived danger. He can read a bus schedule and figure out how to go from Point A to Point B on a bus (and also on a bike). He has had many years of negotiating with his friends in figuring out rules for their games and knows how to get along with others and compromise when necessary. He has dealt with disappointment (usually in the form of a poor grade on a Latin test) and does not appear to be traumatized for life because of it. If anything, the disappointment is a motivator to improve. I feel sorry for all of those kids who have their parents do everything for them and shield them from dirt, injury, and disappointment. They are missing out on life. Cyn, that’s awesome! I do karate and I teach it as well. Last year I taught a 5 year old, who was super unfocused – his dad was making him do it. After several weeks, we finally hit upon “the thing” to not only make it fun for him, but also get him to learn. He got his next belt, and was having fun finally learning the new material for the one after. His dad pulled him because “he wasn’t learning fast enough.” We were all baffled at that one. I can’t resist to share this free range example. Yesterday we went for family summer clothes shopping. With a cart full of clothes my 6 year old went by herself to a register while we, parents, were still debating over a shirt. I overheard typical Qs like – where is your mummy? etc. but chose to ignore them. By the time we caught up with her most items were scanned and the stunned cashier was raving over her being independent, brave and very social. I explained that this is the goal of our parenting and it would defeat the point of her being bilingual with open world opportunities if she would cling to my skirt all her life. Hey, good point! Bonsai IS a better metaphor than helicopter. The metaphor of parent as helicopter, swooping down and getting involved when something goes ‘wrong’ for the child actually suggests the child is able to DO SOMETHING to ‘necessitate’ parental involvement. Bonsai parenting on the other hand, doesn’t even let things go that far. The “too exciting for a pet” was the rescue’s way of saying, “Your children will probably abuse the dog out of ignorance and then when it snaps at them protecting itself, you will have it put down.” Unfortunately those people will go on to buy a puppy from a puppy mill or a backyard breeder thus keeping them in business. Rescues need to figure out a way to TEACH people to be good animal owners rather than automatically rejecting them because they fear the worst will happen. We got our first dog (an elderly neighbor’s grown poodle) when I was two, and I learned the hard way what a dog would and would not tolerate. When I’d cry to my mother about getting bitten my mother would clean the bite and ask what I had done to the dog and then I’d usually get punished for mistreating the dog. These days if a dog so much as shows its teeth to a child the dog is put down or dumped. So, if we’re supposed to do all the doing for our kids, who’s going to do the doing for *their* kids? Helicopter or Bonsai (I do like that analogy) parenting is short-sighted. Too many parents have forgotten that the sacrifices they make in the name of safety also keep their kids from learning the life skills they’re going to need later on in life. If children are not taught to keep themselves safe, who’s going to keep them safe when mom and dad are no longer around? Whos’ going to teach *their* kids to keep themselves safe? Ultimately, we’re talking about the continuation of our species, and too many parents have lost sight of this. Thank goodness Free-Range Kids is around to let us know we’re not alone in wanting to raise our children to be productive and self-sufficient adults! I just took my five-year-old son to see The Croods. I know, it’s been out for like a month and everyone probably knows all about it, but I was surprised at A) how good it actually was, and B) the great free-range message of the story. The caveman father in the movie wants to keep his family safe by literally keeping them in a cave under a rock. Admittedly, there are many dangers in their world–all kinds of creatures are waiting outside to eat them up. Of course, in spite of this, the oldest daughter grows tired of hiding and ventures out on her own. In spite of the father’s worst fears (he keeps saying, “Fear keeps us alive.”), things do work out, and for the better. By the end of the movie, he’s telling his family to no longer be afraid. I feel sorry for that dog. A house full of kids would be paradise for a canine in need of exercise and attention. Bonsai parenting is a better phrase for what I have thought of as “inauthentic experiences”. To me it’s not that these kids can’t have too much excitement, it is that our experiences have to be deliberate, planned, controlled, and high-yield. 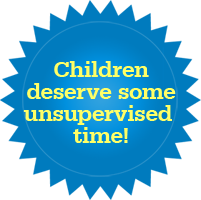 As a result, kid’s experience is artificial and the pay-off is unearned. For instance, a trophy for everyone instead of the pride that comes from improving from bench-warmer to sometimes-starter. Or, a resort vacation where hard-working 9-year olds are treated to nice dinners versus a vacation hiking in the Grand Canyon. The best example I have of the “inauthentic” is the week we spent with my son at Cooperstown Dreams Park Youth Tournament which is any Free-Range parent’s worst nightmare. For the price of a week-long trip to Europe the kids are treated to a week of “feeling like a major league ball player!” where they receive swag, treats, and rewards all week long no matter how hard they did or did not work for it. 14,000 12-year olds compete in this tournament every summer (and BTW, according to their site each one is a “hero”). The tournament includes “rich traditions” that were manufactured by the business owners ten years ago. The theme of the tournament purports to be “authentic baseball experience” but the whole time I was there I felt enveloped by phoniness and the feeling that I was being taken for a ride (it’s not cheap.) More, I was surrounded by families who did not see one speck of falseness in the whole experience. I can’t believe these shelter people are honestly mistaken. It has to be that they’re just evil. I let mine grow wild, clip ’em every now and again. Fun…fun… fun? Oh yeah, now I remember that’s what kids used to do before we decided that “hot house lilies” were better than “weeds”. This wouldn’t be so bad if parents and officials were content with their own kids. However, they want to control how others raise their kids and that’s what causes the problems. I prefer to raise Willow trees that are tough and pliable. Bonsais are like the orchids of the tree world. Pretty, yes, but way too much effort and entirely too delicate. Give me a flowering Cherry or a Weeping Willow any day. Parenting too has turned into a high maintenance activity– just like trimming Bonsais. My mother always said don’t try to make a happy child happier and it was the best advice I ever got. Adults like to complicate things (like the pet adoption process) so much that it takes the basic joy out of simple activities. Besides, you can’t actually climb a Bonsai tree, can you? The other comparison I often hear/read when it comes to raising completely sheltered children that experience nothing, is ‘treating them like princes/princesses’. I was reminded of that when I read about a 46-year-old father or three daughters saying that his children need to make their own mistakes. He intended to give them that space. But oh well, what would Willem-Alexander of Orange know about raising princesses? Something called “Cooperstown Dreams” just doesn’t *sound* authentic. It does sound expensive, though. Or hothouse parenting, after hothouse plants, that are raised in safe, controlled environments but will never survive outside in wind and rain and weather. Good news moment: Last winter, 2 of my nieces (then 8 & 12) spent 2 weeks at my house, & then last summer, they each were here for a week. This weekend, they (now 9 & 13) came with another aunt for the day. My SiL didn’t remember how to get to my place, but the girls recognized the bus stop & were able to tell her where to turn. Bonsai parenting is a better phrase to describe how many parents trim, prune, and groom their children for display. That’s perfect! I also like the term, “Free Range Kids” as opposed to caging them. Smothering kids in bubble wrap has a similar result as caging hens. Children don’t develop, get bored, revolt and resent the fact that they are not acknowledged as a young adult. I guess it is fitting that as a free range parent my favorite flower (and symbol) is the dandelion- resilient! The more I think on it, pondering no small wonders – I come to the conclusion that family life is entirely ripe for value added. What is wanted is the correctly “imaged” product. No blood, sweat and tears, and certainly no freedom. For, freedom, you see – smacks too much of wilderness. And wilderness is not too happy with the human lot, at the moment, it seems. What with all the trashing we perpetrate in the name of “free” enterprise. So perhaps a kind of collective human “guilt” would have us just freely dis-associate entirely and altogether from any notion that “wildness” runs anywhere within the collective human psyche. We can be “virtually” wild, instead. Oh joy. Patented, owned and controlled and brought to you by your alternative sponsor. There’s another kind of pruning that isn’t bonsai pruning but maintenance of fruit trees to make them bear fruit better. If you allow a fruit tree to get too crowded with limbs going everywhere, and every blossom turning into a fruit, the fruits produced will be smaller and the tree weaker. With the application of a little adversity (pruning limbs and pinching off small fruit) you let light in to the core branches of the tree and give the best fruits space to mature. Similarly in parenting, as in your own self-development, it’s advantageous to let life prune you back – to have set backs and dead ends…to let go of things, to simplify and not try to be all things to all people or be the best at everything you do. This strengthens, and opens up space for light to come to our centers and for our best fruits to mature. We can help our kids prune in this way… Or think about neuron pruning that happens after the explosion of connections in the brain in the early years…we can help that pattern repeat at higher levels – branch out, make a lot of connections, set a lot of fruits, then make some judgement calls, prune back, choose what to tend and what to end. they’re more often than not people who love dogs/kids to bits, but love bossing people (and animals) around even more. Combine the two and you get a situation where they make up so many (and such idiotic) rules and regulations that it becomes impossible to comply with them all, giving these people (who have the power, granted by their contracts and/or the government) an excuse to take your dogs or kids away and keep them for their own. which is a sign of the trees being planted too close together. In the wild some of those would whither and die, allowing the rest to grow stronger and larger. With animals, they’ll spread out and settle new territory when not restricted by external factors (like being rooted down because it’s “not safe” to see beyond the garden fence…). Of course humanity has now restricted itself to the orchard that is the earth, become too risk averse to spread out, and the only possible outcome can be extinction. I have followed you for some time and really enjoy your take on raising children…think I must have been a Free Range Parent way back since one of my boys said one of the things he really valued about me as a parent was encouraging him to be independent! I think you have many fans here in Australia. Bonsai kids, love the term, sometimes think the bonsai parents are also too afraid to let them grow. Me I’m trying to grow poplars, can survive just about anything and grow back (there are rows of them in Central Otago that used to be fence posts, as in the trees were cut down and milled into posts, but they still grew back into trees). Oh, also keep getting asked if I’m going to get my pointer cross a warm coat, a water proof coat or a warm water proof coat. We live in a temperate climate, get snow on the ground 3 times a century and a handful of frosts a year, and he’s a DOG! Lenore, your tag line at the top is “how to raise safe, self-reliant children”. I have two young kiddos, too young for many of the free range ideas discussed here, but what I would love to see is information on HOW to raise them to be self-relaint. Being a parent involves training your child without stunting them, so instead of focusing solely on the sensational stories, I would love to see more of the “how to” that you talk about. How to teach my young toddler safe boundaries when playing outside, how to teach my children the skills required to settle conflicts between them so that I’m not solving problems for them, etc. If I may be so bold, the thing is that the best guidelines for raising your kids are the ones YOU feel are such, given your specific situation (it’s not the same letting a toddler play by themselves in an urban surrounding than a rural area). What we’re generally complaining about is the heavy criticism parents are subjected to for cowardly, inappropiate or often just stupid reasons. No one knows your kids like you do. Your neighbourhood is unique, and you know your surroundings much better than Lenore (or any of us) know them. The bottom line, I guess, would be: trust your instincts, trust your children, trust your community. One of the problems I see when stunting natural curiosity (remember it killed the cat!) is that it also stunts the natural instincts that we’re born with. Some are wired differently, but most of us can feel danger (and the adrenaline response) to assess the situation and get out (think of a powerful lightning storm). Dogs feel it too. But now if they act out (which some do) they’re prescribed doggie prozac or the special doggie straight jacket to “calm them” for $79.95. Google it- it exists. With kids, I think some parents out there truly feel that the more they DO for their child, the better parent they are. Parenting has gone to such a high intensity level that sitting back and letting your child attempt skills is seen as lazy. I argue that it’s harder to watch without correcting but often times I learn better ways to do things. There is nothing natural about “bonzai parenting”. That’s like trying to create a whole new species by splicing different genes together. “Don’t fix what isn’t broke”, cuz you’ll always mess it up. I think the challenge facing me most as a parent is judging when my kid is able to handle something for himself. I tend to believe (and I think it’s reasonable to say this) that Current Opinion/Standards are wrong and horribly discount children’s abilities. Yet in the absence of such ready standards, it’s on my head and shoulders to figure whether he can swing the thing or not. But so it goes. I remember years back as a teaching assistant being stunned to hear an undergrad complain about a grade (we NEVER complained about college grading) and base her reasoning upon what her mother told her on the phone (at a distance from it all). What’s with this?